This is about her life… and about others’ lives, too. Everyone has something difficult to overcome or deal with, so what makes author Kaleda Carthran’s story different from yours and from the rest? 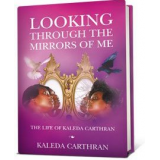 Because in Looking Through The Mirrors Of Me, she invites everyone to witness how God has used her to help all of you who read this book, her story, her life. With candor and energy, the author bares the many closets of her young life to give you a mirror that reflects what or who you may not want to see or may have kept hidden. This unveiling of her life is to give solace, hope, and inspiration to those who have had problems with their mothers; felt left out like the black sheep of the family; may be having a baby and cannot see a way through; have cheated on their spouses; and are waiting for their spouses to get it together. This memoir is especially written for those lost ones who have: taken pills and got addicted to them; started drinking and made a mess out of everything; tried taking their own lives because they couldn’t see hope; moved from home to home because money just wasn’t right; and struggled with their homosexual lifestyle and don’t see a way out. As you turn the pages of this book, you will gradually understand the author’s life and the experiences that have gotten her to the place where she is now—delivered and free. She hopes that through sharing her personal story, she will be able to touch lives and bring forth change and redemption. Milwaukee, WI – January 6, 2011 – This is about her life… and about others’ lives, too. Everyone has something difficult to overcome or deal with, so what makes author Kaleda Carthran’s story different from the rest? Because in this newly published book, Looking Through The Mirrors Of Me, she invites readers to witness how God has used her to help all those who read this book, her story, her life. With candor and energy, the author bares the many closets of her young life to give readers a mirror that reflects what or who they may not want to see or may have kept hidden. This unveiling of her life is to give solace, hope, and inspiration to those who have had problems with their mothers; felt left out like the black sheep of the family; may be having a baby and cannot see a way through; have cheated on their spouses; and are waiting for their spouses to get it together. This memoir is especially written for those lost ones who have: taken pills and got addicted to them; started drinking and made a mess out of everything; tried taking their own lives because they couldn’t see hope; moved from home to home because money just wasn’t right; and struggled with their homosexual lifestyle and don’t see a way out. As readers turn the pages of this book, they will gradually understand the author’s life and the experiences that have gotten her to the place where she is now—delivered and free. She hopes that through sharing her personal story, she will be able to touch lives and bring forth change and redemption.